Sunscreens- what, when and how to use? Sunscreens are amongst the most commonly purchased over the counter products as well as among the commonly prescribed preparations among the dermatologist, despite of the fact that sunscreens are often underused or improperly used by most people. Sunscreens are not to be used during beaches days only, but are useful for your each and every day. Sunscreens generally act as shield which protect our skin from the harmful effects of sun rays, particularly the UVA and UVB rays. The harmful effects of these sun rays include sunburn, photodermatoses like polymorphous light eruption, tanning, aging etc. SPF or sunprotection factor refers to ability of a sunscreen to protect the skin from burning due to sun’s harmful UV rays (particularly UVB). 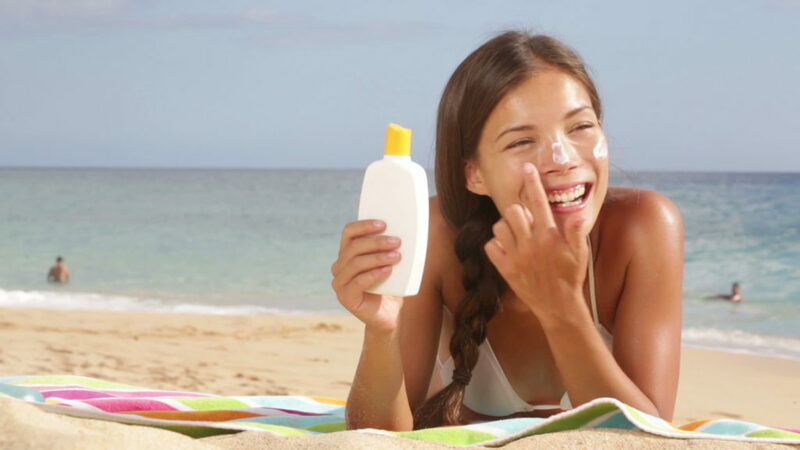 It is advised to buy a sunscreen with SPF>30. But higher SPF does not necessarily mean a better sunscreen. For example, a sunscreen with a SPF 30 gives about 97% protection against UVB rays while one with SPF of 50 gives around 98% protection. In Indian conditions, any sunscreen with a SPF of 30 or above is deemed to be good enough. For prevention of tanning, a more important factor is protection factor against UVA which is the important cause of pigmentation. This is measured by UVA 4 star rating or Boots star ratings. A good sunscreen should ideally contain substances which protect against both UVA as well as UVB rays. Suncreens come under various formulations like gels, aqualgels, creams and lotions. Aquagels and creams are better for people with oily and acne prone skin while lotion is good for people with dry skin. In children sunscreens with purely inorganic components like titanium oxide, zinc oxide should be used (eg. Spectraban-19). The reputed manufactures of sunscreens like GSK, Galderma, cipla etc are better than cosmetic brands. How to use Sunscreen in a proper way ? Sunscreens should be applied uniformly and liberally, 15 to 30 minutes before sun exposure. Sunscreen should be reapplied every 2 hours outdoors. Up to 85% of the sunscreen might be removed by towel drying , so reapplication is recommended after swimming or sweating. How much Sunscreen to apply? The amount of sunscreen required for each body part can be easily calculated by ‘the Teaspoon rule’. You require 3 mL (approximately half a teaspoon) of sunscreen for each arm, face and neck. You need 6 mL (approximately one teaspoon) of sunscreen for each leg, chest and back. 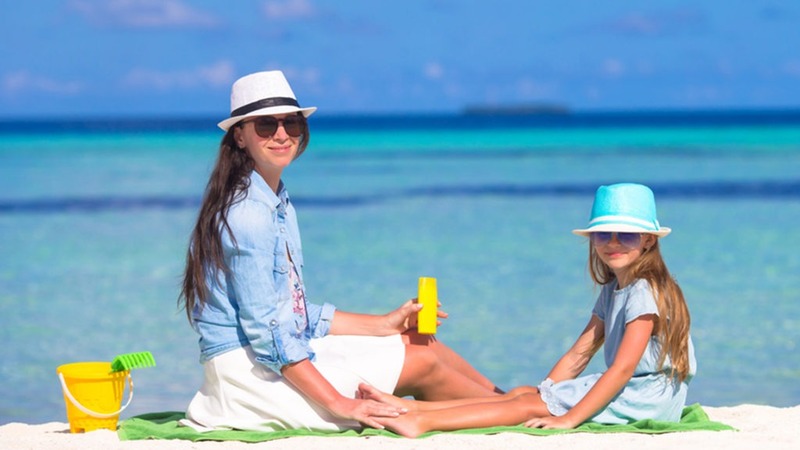 In addition to use of sunscreen it is preferable for one to use physical methods to protect from the sun, such as use of an umbrella or use of a wide brim hat particularly if one has photosensitive skin conditions. Sunscreens play an important role in preventing ultraviolet rays induced damage to the skin as well in treatment of various sun induced skin disorders. So it is mandatory to know about proper usage of sunscreens to protect the skin from the harmful effects of the sun. Note: “For any query, contact us at +918588827963, +918882227080 or mail us at enquiry@dermaclinix.in”.